The U.S. bank prime rate was unchanged in the first half of February, at 3.25 percent. Last month it was consumer non-rewards credit cards. This month it's business rewards credit cards. It is not all happening at once, but credit card rates seem to be creeping upwards. The increase in business rewards credit card rates in the first half of February can be attributed to just one of the credit card offers tracked in this survey, and the rise in consumer non-rewards rates late last month was an isolated incident as well. However, when events like this are put together, it begins to look like a trend; specifically, it is a trend that has seen both consumer and business credit card rates rise already in 2013. Consumer prices were unchanged in December, and actually declined in the fourth quarter of 2012. The initial estimate of real Gross Domestic Product was that the economy actually shrunk a little in the fourth quarter. The first look at job growth in the new year, the January employment report, showed mediocre job creation and a slight uptick in the unemployment rate. If neither rising inflation nor robust economic growth are driving interest rates upward, why are credit card rates rising? Recent increases could still be just isolated decisions by individual credit card companies, but another possibility is that credit concerns are growing. If credit card companies feel that rising credit burdens and a persistently weak economy are creating higher default risks, they could attempt to hedge that risk by charging higher interest rates. If this is the reason behind rising credit card rates, it is especially worrisome that it has now affected both consumer and business credit card rates. After seeing a rise in non-rewards credit card rates in late January, consumer credit card offers were unchanged in early February. Despite this lack of movement for the market overall, consumers should be aware that there is a substantial variance among credit card rates currently being offered by different companies, so smart shopping can make a substantial difference in obtaining a lower rate. 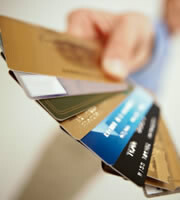 The average student credit card rate remained at 17.54 percent as of mid-February. This is still the highest average rate of any category tracked by this survey, though at least this rate has remained steady since mid-November of last year. While non-rewards cards remained unchanged at an average of 14.74 percent, the average rate for business rewards credit cards rose to 16.0 percent. This marks the highest average rate for business rewards credit cards since September of 2011. The rise in business rewards credit card rates increased the difference between rewards and non-rewards credit cards, making reward programs relatively more expensive. However, businesses can still negate the impact of this change by paying their credit card balances off in full every month, and thus not paying any interest. Since all consumer credit card offers tracked by this survey were unchanged in early February, the spread between rates for people with excellent credit and those for people with average credit remained the same, at 4.03 percent. 0 Responses to "Business rewards credit card rates rise"